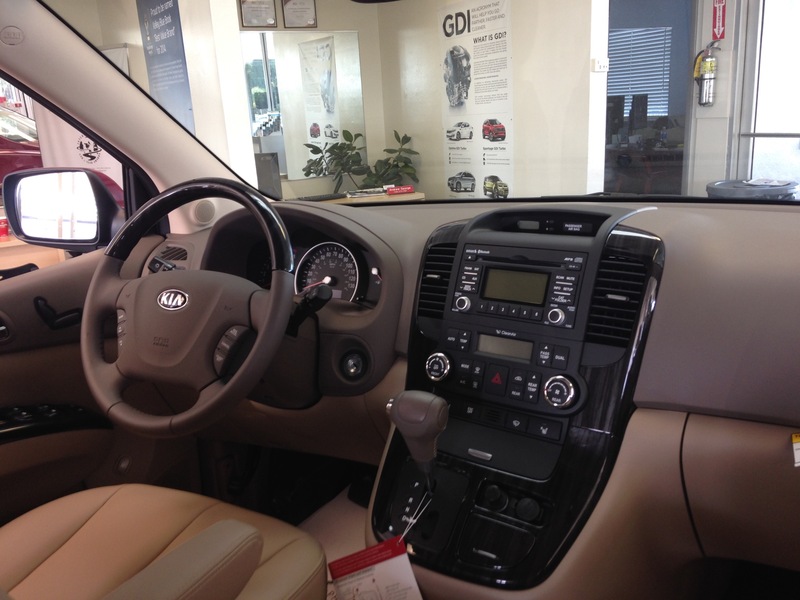 After a year of absence from the Kia lineup, the Sedona minivan returns for 2014 with significant updates. This will be the last year for the current Sedona as a redesigned van will arrive for 2015. Despite being on the market for more than seven years, the Sedona hides its age well allowing for generally good impressions. 2014 brings a reworked front fascia with two strips of LEDs and a new lower grill. Chrome strips, and Kia’s corporate “Tiger Nose” upper grill help bring the styling in line with the rest of the lineup. The headlights are somewhat triangular in their shape and the short hood features a slight bulge that helps to highlight the grill below. The sharp crease below the side windows and slightly bulging wheel wells add some character to the van while plastic strips attached across the doors helped keep the Sedona from looking slab-sided. The rear of the van features a large hatch and very tall angular tail lights. Overall, the Sedona’s styling looks modern and clean, if a little plain. Inside, the van has a commodious, mostly well put together interior. The front leather seats were exceptionally comfortable, and headroom was aplenty. The leather wrapped steering wheel only tilted and did not telescope, perhaps limiting comfort for some drivers. The instrument cluster was easy to read and adequately comprehensive, while the center stack was within easy reach. Controls for the infotainment system and climate control seemed logically placed and a storage bin with various auxiliary power outlets was located below the climate controls. Oddly, the Sedona featured a cigarette lighter and ash tray possibly making it one of the last vehicles sold in the United States to include these features. Towards the bottom of the dash, cup holders could be pulled out and a small glove box accessed. A larger glove box providing ample room for napkins, books, and miscellaneous items could be accessed on the passenger side. A small tray located between the front seats offered storage space for only thin items however it could be folded away to create a sizable pathway to the rear of the van. The second row captain’s chairs were very comfortable although they could not be folded into the floor. The third row seat was comfortable as well, and space seemed plentiful. 32.2 feet of cargo space can be used behind the third row seat, while this can be expanded to 80.1 cubic feet when the third row is folded, while 141.5 cubic feet can be found once all of the rear seats are stowed away. Total interior volume is 172.3 cubic feet. The interior was nicely constructed towards the front as many materials were soft to the touch, however the hard plastics used in the rear of the van felt cheap in places. The Sedona uses Kia’s 3.5 liter V6 which produces 269 horsepower and 246 pounds-feet of torque and is paired only with a six-speed automatic transmission allowing the Sedona to tow 3,500 pounds. Fuel economy is rated at 17 mpg in the city and 24 mpg on the highway. Two trim levels are available, the base LX and the more upscale EX. Highlights of the LX include sixteen inch steel wheels, cloth seating, SiriusXM Satellite Radio, auxiliary input jacks, a reverse warning system, tire pressure monitoring system, and stability control. The EX demands $5,000 more over the $25,900 price of the LX and adds seventeen inch alloy wheels , chrome exterior trim, heated side-view mirrors, dual-zone climate control, standard power-sliding doors and power hatch, an optional navigation system with an Infinity sound system, leather seats, powered and heated front seats, and an optional sunroof among other features. 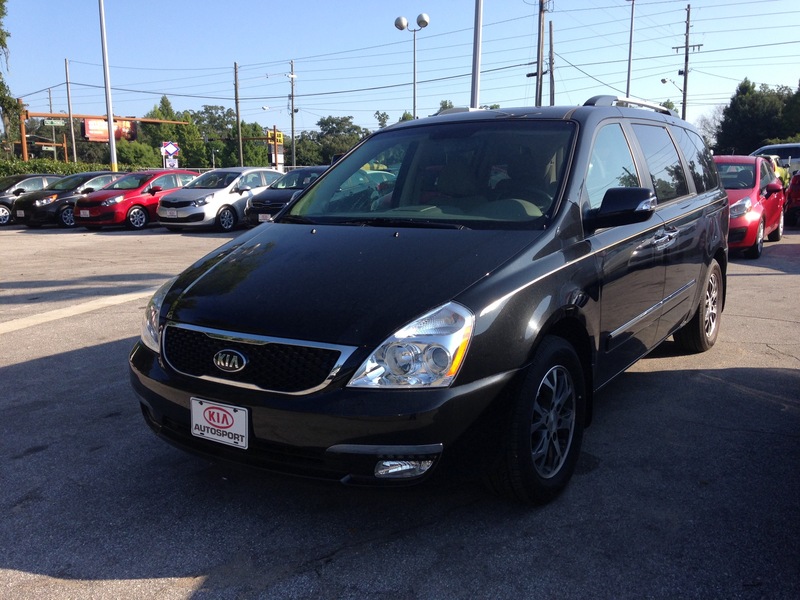 Kia Motors America, Inc. 2014 Kia Sedona Minivan – Trims & Colors. N.p., n.d. Web. 03 Oct. 2014. <http://www.kia.com/us/en/vehicle/sedona/2014/trims&gt;.